Abbaszadeh, Shahab, Gohari, Hamid. (1392). Transition from Detached Plazas Close to Traditional Bazaars towards Reviving Lost Spaces Close to Contemporary Shopping Centres, Case Studies: Proma Shopping Center and Bazaar-E Reza in Mashhad. معماری و شهرسازی آرمان شهر, 6(10), 175-190. Shahab Abbaszadeh; Hamid Gohari. "Transition from Detached Plazas Close to Traditional Bazaars towards Reviving Lost Spaces Close to Contemporary Shopping Centres, Case Studies: Proma Shopping Center and Bazaar-E Reza in Mashhad". معماری و شهرسازی آرمان شهر, 6, 10, 1392, 175-190. Abbaszadeh, Shahab, Gohari, Hamid. (1392). 'Transition from Detached Plazas Close to Traditional Bazaars towards Reviving Lost Spaces Close to Contemporary Shopping Centres, Case Studies: Proma Shopping Center and Bazaar-E Reza in Mashhad', معماری و شهرسازی آرمان شهر, 6(10), pp. 175-190. Abbaszadeh, Shahab, Gohari, Hamid. Transition from Detached Plazas Close to Traditional Bazaars towards Reviving Lost Spaces Close to Contemporary Shopping Centres, Case Studies: Proma Shopping Center and Bazaar-E Reza in Mashhad. معماری و شهرسازی آرمان شهر, 1392; 6(10): 175-190. 1Ph.D in Architecture, Department of Architecture, Faculty of Architecture and Urbanism, Hakim Sabzevari University, Sabzevar, Iran. 2M.A. Student of Urban Design, Faculty of Urban Design, Zanjan Branch of Azad University, Zanjan, Iran. - Ardalan, N. & bakhtiyar, l. (1999). The Sense of Unity: The Sufi Tradition in Persian Architecture, USA: ABC International Group. - Bullen, P. Onyx, J. (1998). Measuring Social Capital in Five Communities in New South Wales: Paul Bullen and Jenny Onyx with Neighbourhood and Community Centres. (2012.3.16), URL: http://www.mapl.com.au. - Bardianamoradnejad, R. (2011). An Introductionto Urban Squares. Sari: Mazandaran University Publisher. - Bentley, I. & alan. Murrain, P. McGlynn, S. Smit, G. (2008). Responsive Environments: A Manual for Designers. London:the Architectural Press. - Canter, D. (1977). The Psychology of Place. London: Architectural Press. - Carmona, M. (2011). The Design Dimension of Planning: Theory, Content and Best Practice for Design Policies. London: Taylor& Francis Group. - Carmona, M., Heath, T., Oc, T. & Tiesdell, S. (2010). Public Places - Urban Spaces. London: Architectural Press. - Cooper, M., Carolyn, F. (2008). People places: design guidelines for urban open space. London: VanNostrandReinhold. - Falamaki, M. (2005). Experience of Urban Restoration: from Shiraz to Venice. Tehran: Faza Publisher. - Goodsell, Ch. (2008). THE CONCEPT OF PUBLIC SPACE AND ITS DEMOCRATIC MANIFESTATIONS. Journal of Planning Education and Research, No 27, 382-399. - Homans, G. C. (1974). Social Behaviour: Its Elementary Forms. New Jersey: Rutgers. - Habibi, M. (2012). From Precity to City. Tehran: Tehran University Press. - Jacobs, J. (1992). The Death and Life of Great American Cities. NewYork: Knopf Doubleday Publishing Group. - Madanipour, A. (1996). 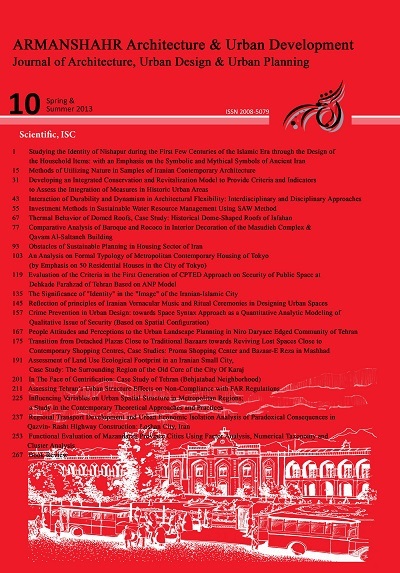 Design of Urban Space: An Inquiry intoa Socio- Spatial Process. London: John Wiley & Sons Publisher. - Movahed, A. (2005). Restoration of Traditional Bazaars. Isfahan: National Conferences Desert Architecture. - Miller, M. (1998). Shopping, Place and Identity. London: Routledge. - Naghizadeh, M. (2010). Analysis and Design of Urban Space. Tehran: Jahad University Publisher. - Norberg-Schulz, C. (2000). Architecture: Presence, Language, and Place. London: Skira. - Pakzad, J. (2007). Guideline Urban Space Design. Tehran: Shahidi Publisher. - Punter, J. V. (1991). Participation in the Design of Urban Space, Landscape Design, Vol 200. - Soltanzadeh, H. (2007). Iranian Bazaars. Tehran: Culture Research Bureau Municipality of Tehran. - Soltanzadeh, H. (2010). Urban Spaces in the Historical Texture of Iran. Tehran: Culture Research Bureau Municipality of Tehran. - Sorkin, M. (2011). All Over the Map: Writing on Buildings and Cities. NewYork:Verso. - Steele, F. (2007). The Sense of Place. Boston: CBI Publishing Company. - Trancik, R. (1986). Finding Lost Space: Theories of Urban Design. Ithaca: Cornell University. - Venturi, R. (2008). Learning from Las Vegas. London: Routledge.